The snow is pretty and not too much of it, Robin. 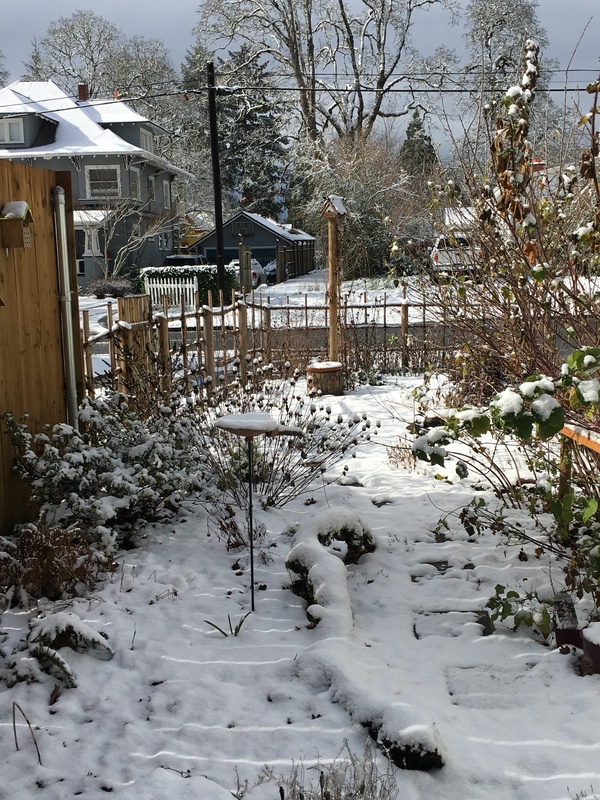 I remember how surprised we were when we moved to Portland and the reaction of the city to snow that first winter. There wasn’t a huge amount, but people didn’t know how to deal with it any better than people in Central Texas. We thought that was kind of funny. We’ve had some sleet on Friday/Saturday, but we just have misty rain today and temperatures are higher. Happily. Hoping this last cold time was perhaps our last of this season – last below freezing. I’m ready for spring. People do go a little crazy around here with snow. It’s even crazier when it snows in Seattle where we used to live! It’s all turned to rain now and buckets of it! That’s more normal, but we’ve had such a mild winter, it’s a bit of a shock. I, too, am so ready for spring! That would have totally overwhelmed me and I would have been afraid to even start planning. Tabor, the gardens in this book are so amazing, but way beyond my humble abilities! They’re fun to read about, though. Iliana, it is full of ideas! The creativity of some of these gardens is inspiring. That’s what I love about reading garden books. Rachel, that’s a very honest way to approach things. I have the luxury of being able to choose to garden now at this stage of life (retirement). It’s something that I value more now and brings me (us) a lot of joy! The snow has destroyed quite a few of our bushes and trees and so I’m going to have to do some heavy garden repair this spring. Maybe it’s time to start looking for inspiration!